Sergeant Jacob Knox leads the Head Knockers, a unit of scout-saboteurs in the war against the Dread Duke and his armies. They are the favorite squad among Captain Brighton's Stormwalkers, until an ambush by shapeshifters kills the Captain, half the company, and Knox's best men. Now the new Captain has new orders: he's sending the Head Knockers to investigate an abandoned village, the possible source of the attack. It's just Knox, his sword, and a handful of boys barely old enough to shave against an evil force burrowed deep beneath the dirt streets of an empty town. Waiting for them there is the Prince of Luster and Decay - the demonic embodiment of greed - and it'll take more than a sword to defeat it. Great Intro to a new fantasy series! 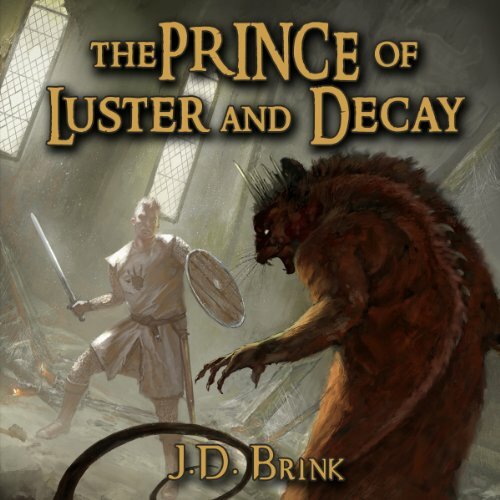 Would you consider the audio edition of The Prince of Luster and Decay to be better than the print version? I loved the battle in the tombs. It's hard to choose between Sgt Knox and the Prince of Luster and Decay. It was a fun, fast paced fantasy adventure. If you are into dark age fantasy, horror and mystery, you could enjoy this one. The narrator has a really nice voice and can act. Sometimes the storytelling was a little too fast for my brain to keep up, but he portrayed the characters so well, that it kept me entertained. This is just a prequel, so the real "good" stuff is yet to come. I suppose that's what a prequel is supposed to do, make you want for more, and I do. If you could sum up The Prince of Luster and Decay in three words, what would they be? What was one of the most memorable moments of The Prince of Luster and Decay? The build up to the final scene was tense. The narrator did a fine job of keeping the atmosphere as the author would have intended. Vocally, Nigel Patterson sounds very like Sir Tony Robinson, which is no bad thing! I shall be looking for the rest of the series!